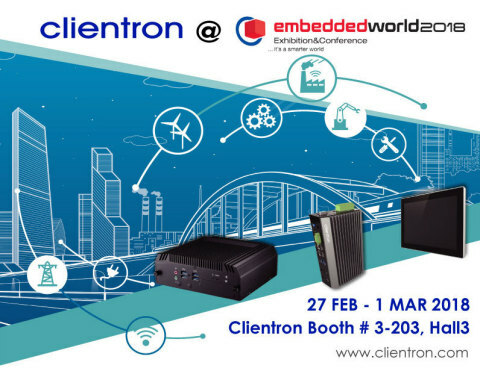 Clientron Corp., a world-leading supplier of thin client and embedded systems, will proudly introduce the latest technologies and applications in the fields of embedded computing and intelligent solutions at Embedded World 2018, taking place at the Exhibition Centre Nuremberg (No. 3-203, Hall 3) from Feb 27 to Mar 01, 2018 in Nuremberg, Germany. The highlights of Clientron's booth include the 3.5” SBC Board Saber-AL-3500 equipped with high performance Intel® Atom™ E39xx processor family offering triple displays and three RS-232/422/485 COM ports; the Embedded System IT900 featuring the main board with innovative drawer design for easy maintenance and flexible e-Door concept for I/O expansion options to fulfill customized demands; the DIN Rail Box PC Mace-AL-200 featuring rich I/O ports, wide temperature and wide voltage; and Industrial Panel PC Pike-AL-1500SP with 15” fully IP65/IP69K rated protection, fanless & stainless enclosure design for critical environment and the most demanding industrial applications such as food industry. For the high-end platform, the IT900 embedded system supports Intel® Core™ i5-6300U processor with Intel® vPro™ technology to deliver Intel® Active Management Technology (Intel® AMT) using integrated platform capabilities and popular third-party management and security applications, to allow IT or managed service providers to better discover, repair, and help protect their networked computing assets. At the show, Clientron will demonstrate its intelligent solutions including industrial panel PCs for food industry, and embedded systems for factory automation, DI/DO access control, remote management application, smart parking, smart intersection, digital signage & digital surveillance solutions. To know more about its custom design, manufacturing capabilities and services, please visit Clientron at booth No. 3-203, Hall 3, Exhibition Centre Nuremberg, Embedded World 2018 or visit its website: www.clientron.com. Clientron was founded in 1983. The company is dedicated in providing global intelligent solutions to our clients. With design, manufacturing, and service abilities, Clientron offers High-quality and High-performance computing platforms including Thin Client, POS and Intelligent System. We are steadfast in our commitment to develop and to provide even more advanced IoT client solution and services for our partners and customers to build an intelligent e-World. Visit us at www.clientron.com.